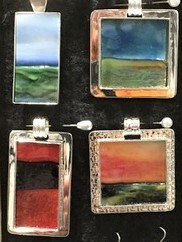 Rochester, MN-based mosaic artist Deb D’Souza will set up in the gallery to demonstrate her techniques. D’Souza’s mosaics are created with either stained glass, pebbles, or tesserae using hammer and hardi. Her technique is one that has been used for ages by the Greeks and Romans. D’Souza is an artist that is drawn to detail and pattern, particularly the kind of detail one may not notice at first glance. She believes that mosaic is a language and tessera are the letters to form the lines/words and sentences. By leading the viewer through the contours, ebb and flow of the subject D’Souza strives for her mosaics to be a study of these rhythms. A mosaic artist creates the feeling of a subject with the materials size, shape, colors and elements. D’Souza’s work is a combination of modern materials and ancient practice still rendered with the same techniques, using stone, glass, hammer and chisel. She is dedicated to preserving the history and tradition of mosaic art, along with the techniques and materials used in the past and believes that one must study and remember the past to be informed for the future.